Process engineers at Friedrich-Alexander-Universität Erlangen-Nürnberg (FAU) have developed a method to determine the size and shape of nanoparticles in dispersions considerably faster than ever before. 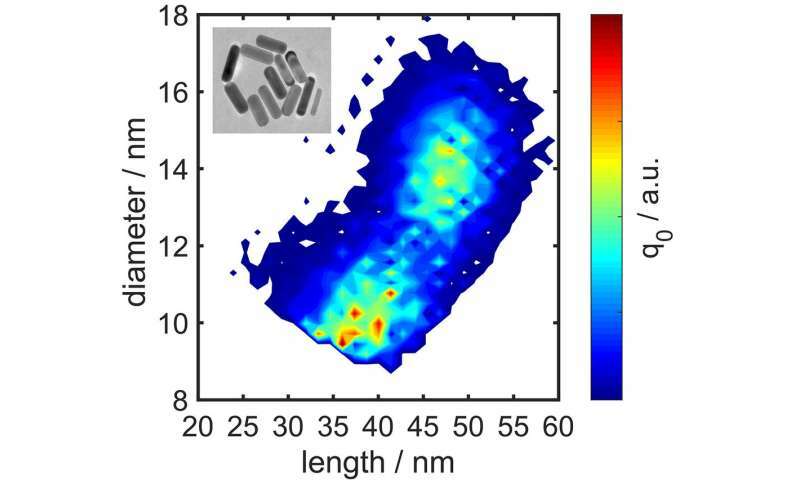 Based on gold nanorods, they demonstrated that length and diameter distributions can be measured accurately in a single step instead of the complicated series of electron microscopic images that have been needed up until now. Nanoparticles from precious metals are used, for example, as catalysts and contrast agents for diagnosing cancer. In the Middle Ages, gold particles were used to create vibrant red and blue colours, for example, to illustrate biblical scenes in stained glass windows. This effect is caused by the interaction between the electromagnetic fields of the incoming light with the electrons in the metal, which vibrate collectively. Nanoparticles of gold or silver are of interest for modern applications in biotechnology and as catalysts, while their optical properties are applied in medical imaging technology, where they act as a contrast agent for diagnosing tumours. The particles are specially synthesised for various purposes, as their properties depend on their size, shape, surface, inner structure and composition. Monitoring this synthesis process is very complex: While it is relatively straightforward to determine the size of the nanoparticles using optical measuring techniques, a great many electron microscopic images have to be analysed in a detailed and time-consuming process before the shape of the particle can be determined. This hinders the development of new manufacturing and processing methods, as time-consuming measurements are needed to keep track of any changes to the size or properties of the particles. Together with working groups from the field of mathematics led by Dr. Lukas Pflug and Prof. Dr. Michael Stingl, and physical chemistry, led by Prof. Dr. Carola Kryschi, process engineers at FAU led by Simon Wawra and Prof. Dr. Wolfgang Peukert have developed a new method for measuring the length and diameter distribution of plasmonic gold nanorods in one single experiment. In a first step, the particles are dispersed in water in an ultrasonic bath, where they sink via centrifugation. At the same time, they are targeted with flashes of light, and their spectral properties recorded using a detector. "By combining multi-wavelength absorption optics and analytical ultracentrifugation, we were able to measure the optical and sedimentary properties of the nanorods simultaneously," explains Prof. Dr. Wolfgang Peukert. The researchers based their analysis method on the fact that both sedimentation speed and strength of light absorption depend on the diameter and length of nanorods. "The distribution of length, diameter, aspect ratio, surface and volume can be derived directly as a result," explains Wolfgang Peukert. The method developed at FAU is not restricted to nanoparticles made of precious metals. It can be used on a number of plasmonically active materials and can also be extended to other geometric shapes. During synthesis, sphere-shaped particles are created at the same time as nanorods, and their distribution and percentage by mass in the sample can also be measured accurately. Peukert: "Our new method allows a comprehensive and quantitative analysis of these highly interesting particle systems. We believe that our work will contribute to being able to characterise plasmonic nanoparticles rapidly and reliably during synthesis and in a number of applications."